I always get these grand plans for how much I will get accomplished in between flips, yet it always ends up that I play catch-up, organize, clean, then wonder where all my time went for DIY or home projects. I won't bore you with my to do list- mainly because looking at it will stress me out. Vacations are great, but I'm pretty sure to do lists double when they see "vacation" on the calendar. I'm lucky enough to have a Hubby who works for a big travel company. Wine tour through Bordeaux? Ok, if you insist. The only bad part is that I'm scrambling to get stuff set before we leave. I would rather not be trying to buy one house and sell another with limited wifi 3500 miles away. I can't be the only one that finds the lead up to a vacation very stressful. Assuming I don't drive myself completely crazy in the next few days, next week posts might be looking a bit more European and influenced by wine. 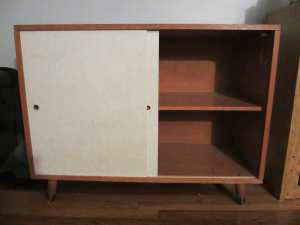 As you can probably guess by the post's title, in addition to scrambling for vacation, I've got dressers on the brain. 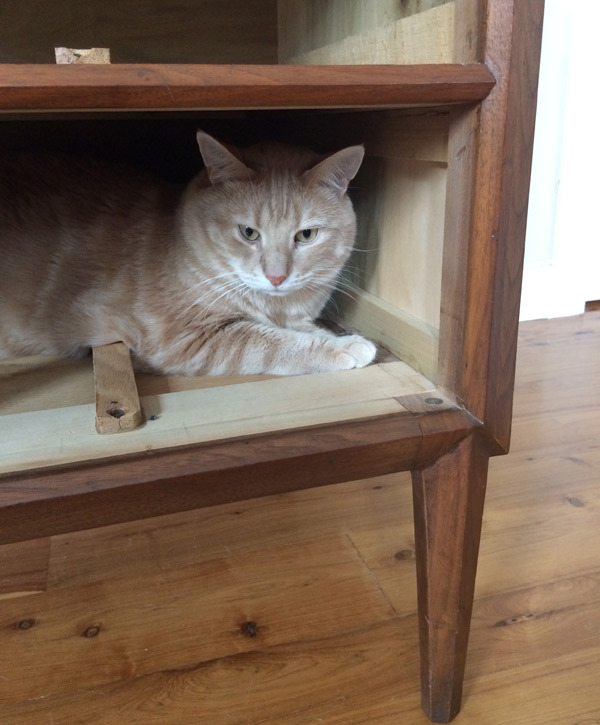 In the midst of buying and selling houses, I'm also apparently buying and selling dressers. I feel like the Oprah of dressers- You get a dresser, you get a dresser, YOU get a dresser! Everybody gets a dresser! Ok, maybe not everybody... just Hubby and Me, whoever buys our old dresser on craigslist, and our future niece. 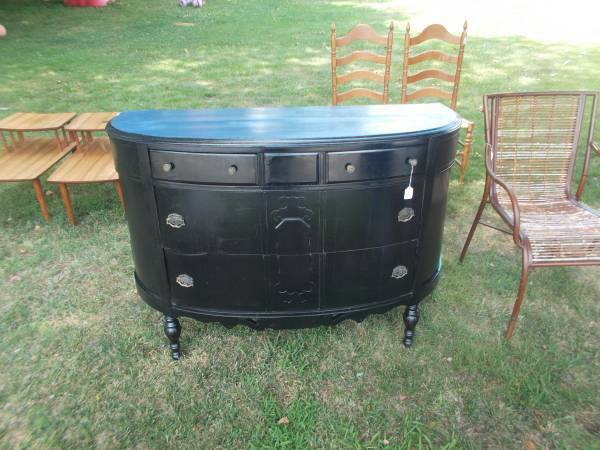 This large black dresser that matches the entire bedroom set is on it's way out- fast. After having it on craigslist for only a few hours, a buyer has checked it out and given me 1/2 the money until he can come back tomorrow and move it. Why am I selling it?? If you follow me on social media, you may have an inkling. A week and a half ago I picked up this guy for a whopping $60. I love estate sales. Since it was the second day, everything was 50% off, making this $75. Still a deal at $75, but I ALWAYS ask if they can do any better and BAM $60. 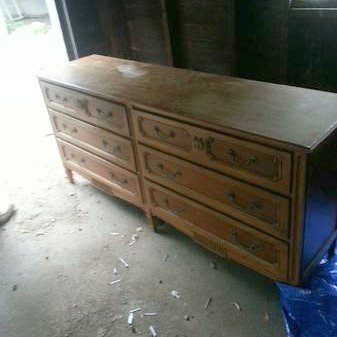 Aside from one broken pull, this dresser is in amazing condition. 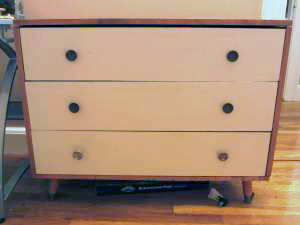 Like better-than-the-condition-of-the-dresser-that-I'm-replacing-and-50-years-older amazing condition. Luckily I noticed the broken pull before taking it home and asked if the sellers minded me taking an unbroken one from the unsold matching night stand. You don't get what you don't ask for! So for a week and a half, although the drawers have made it up the stairs, this has been the view from the couch in the living room. These are the times where a garage would come in really handy. The new dresser doesn't fit in the bedroom until we clear out the old one. 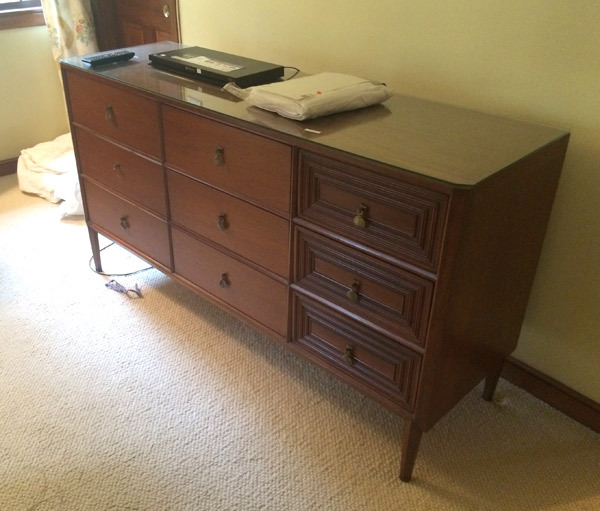 Tomorrow, pretty new dresser. Tomorrow! I can't wait. This dresser's so much prettier in person. The cat's agree. Gratuitous cat shot? sure, but just take a gander at that dresser leg and the faceted detail! The shape mesmerizes me. It'll be fun and girly without being cutesy or too girly. Fingers crossed that it only needs a new paint job! After this week, I think I'm going to put an embargo on moving any more dressers. 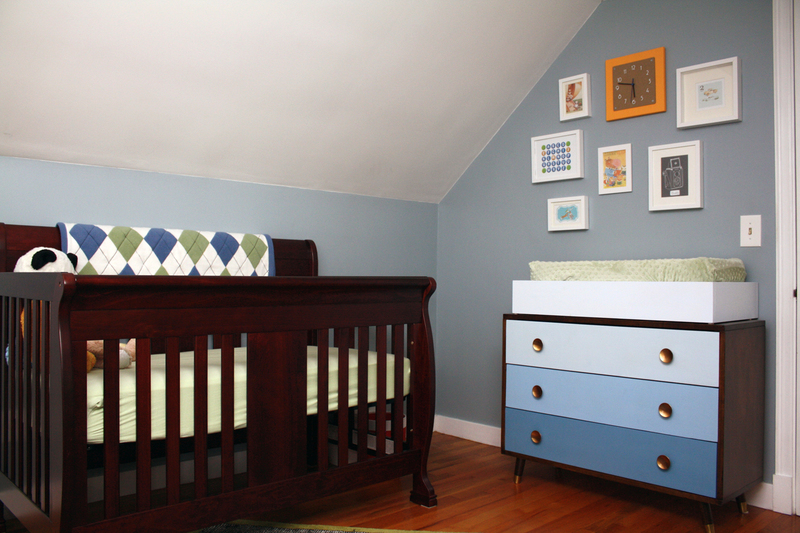 The crib and the rocker will be making their way into my niece's room, but that's all she has currently! 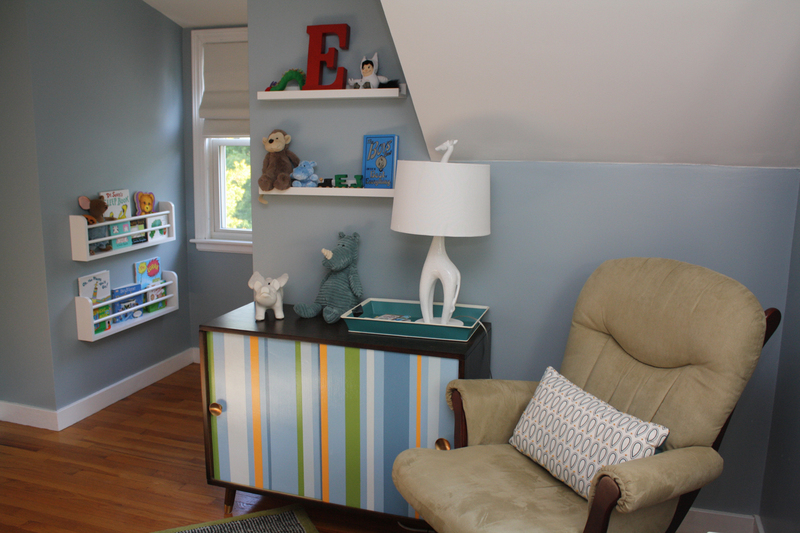 Her room will be directly across the hall from my nephew's and will practically mirror his lay-out wise. Lucky for her, though, it's just a smidge bigger, so I'll be able to fit a full-size dresser/changing table. The craigslist hunt is ON! 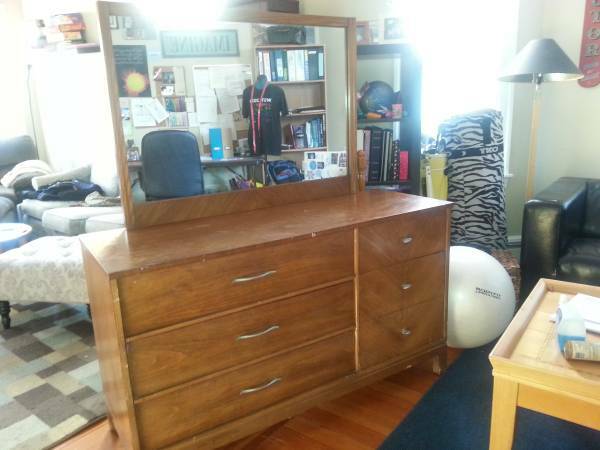 Since the rest of the room has yet to be designed, I'm open to any style of dresser that I can get a good deal on. As you might be able to guess, I'm partial to antique. 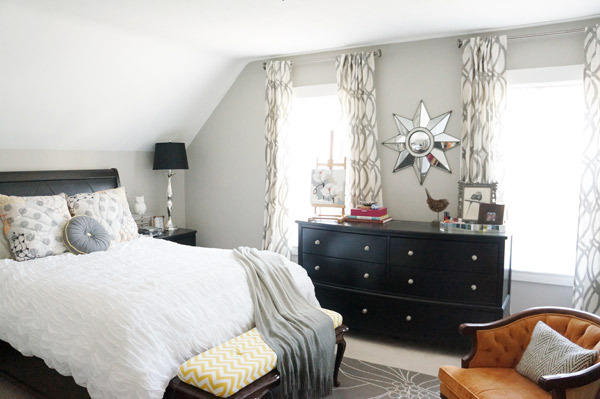 I've got my head stuck on painting a piece gray and white which will compliment the soon-to-be sunny yellow walls perfectly, but if I find a piece in the right condition stained, that plan could certainly be revised. This first dresser would look delightful painted, but I have a feeling it's just a bit too large for the room. This next one caught my eye. I can't quite tell how damaged it is, but I am intrigued for $50. This one might be a partial-paint to cover blemishes, but that graining is just so pretty! Another thing about this one is that I can't tell the age. If it's newer, it might not have the best construction and not be worth refinishing, but if it is antique I'll bet it's solid as a rock. With an e-mail out to the seller, we shall see. I love the shape of this one. It has a fresh coat of black which looks nice but would be WAY too dark for the room. The good news here is that it's already painted so I wouldn't have to worry about ruining beautiful wood! I'm also keeping my eye out for a more mid-century piece. Might be nice for it to relate to her brother's room a bit? It'll all come down to finding something in solid condition at the right price (aka cheap). Which one would you pick? "What piece of furniture would you save from a fire?" Of course I just HAD to throw my hat into the ring. I'm always so indecisive, so it's lucky that Emily's allowing multiple entries. Here goes! I'm sure that once my secretary desk is done, it'll be on the top of this list, however, since it's current state is still in shambles, it's not quite the prized possession yet. Once Clark is done, this desk is priority numero uno! But what would I save from a fire? Can I save my future sofa? 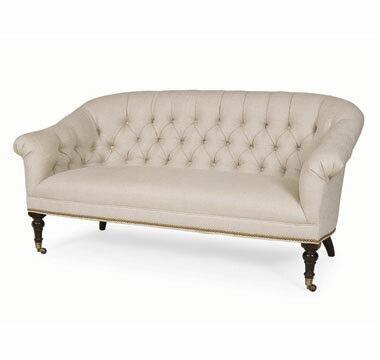 The first piece of furniture that I'd save is probably my $30 vintage Craigslist settee. Although it's a newer purchase, I don't think I could have imagined a better piece of furniture for my office. I adore the tufting and the unique color (and the price I got it for! )and my furry roommates love it too, which makes it even better. 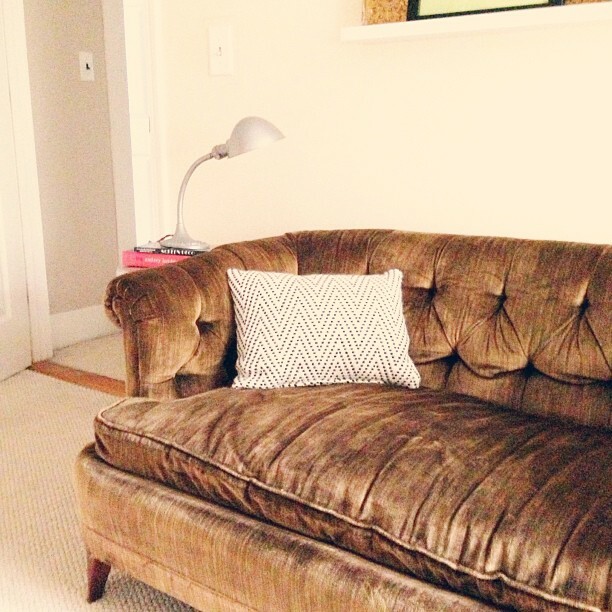 Although I got it in lieu of spending the money to reupholster our other vintage settee which has been living in the basement, I think both with be sticking around for a very long time. 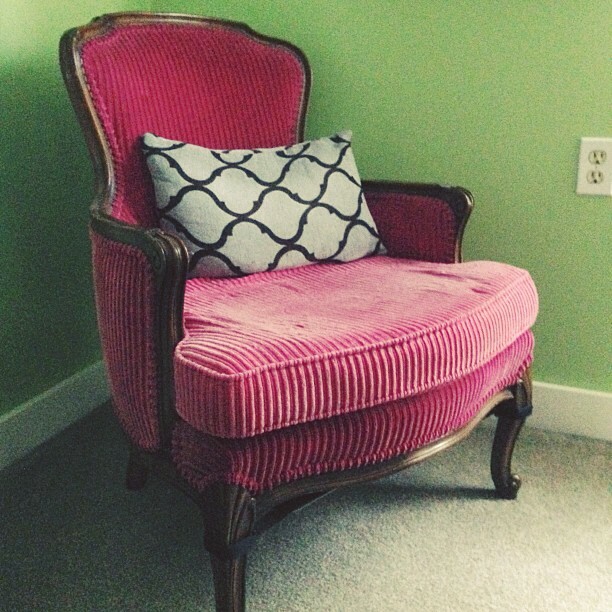 The second piece of furniture that I'd save in a fire is our red antique chair. This we adopted (along with its matching settee that needs reupholstering mentioned above), when a friend's aunt passed away. The set had been in our friend's family for as long as he could remember and he was really pleased when Hubby and I gave them a good home. Although Hubby's not as enamored with the Craigslist settee as I am, this red chair is one I'm sure he'd be saving in a fire too and it's so rare that we agree on design pieces! 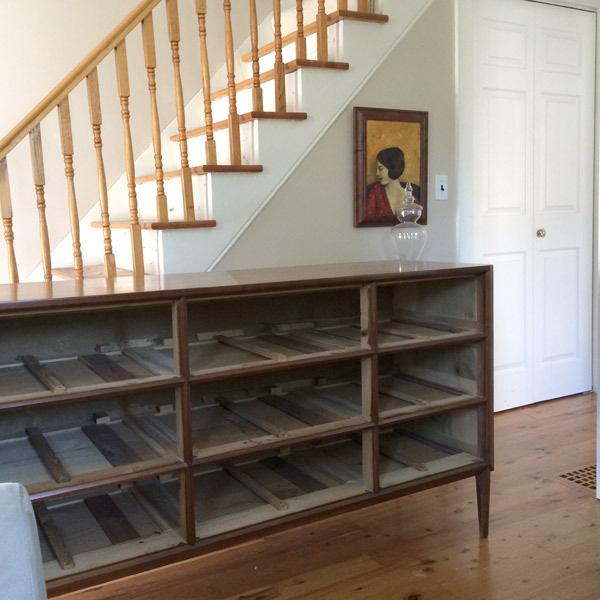 With my estate sale/tag sale fixation, it's a wonder that my furniture list isn't longer. I have several pieces awaiting rescue/refinishing in the dungeon basement that I'm sure will move swiftly up the list when done, but until then, I don't have a ton of prized pieces. 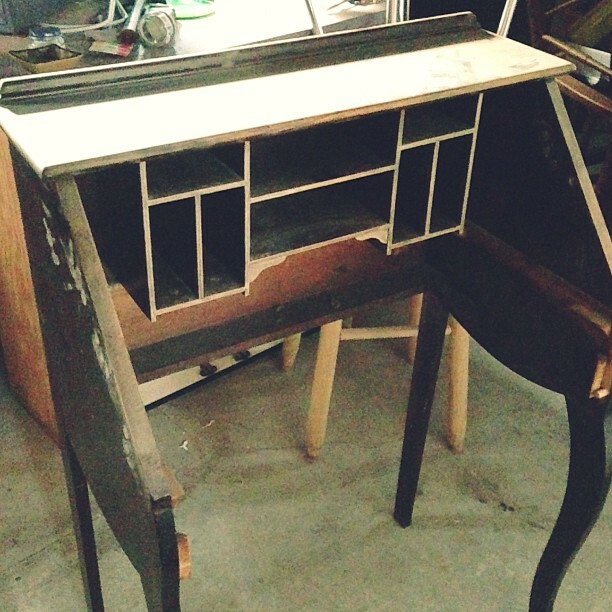 Space is limited in this tiny house, so I usually find myself taking home smaller pieces when I go treasure hunting. What furniture would you rescue in a fire (assuming that strength is no issue and you can throw any piece over your shoulder)?